The Airport of Barcelona is about 13 km from Barcelona center. Trains and buses have frequent schedules to the center, but since you have to change a couple of times and also to walk the last part to the terminal, the best option for traveling from the airport to the cruise terminal is to catch a taxi. Taxis are quick and not expensive. The journey will take about 35 min's by taxi. The journey from the airport to the port is unlikely to cost you more than €40. If you are a group of 4 or more you might consider a private transfer with Barcelona-airport-transfers. Luggage storage is only possible at terminal 1 (intercontinental flights) or at train station Sants Estacio (directly connected to the Airport and Plaça de Catalunya. The port is the starting and arrival point for many Mediterranean cruise itineraries. The seven operating terminals, and the various docks and facilities, are at a short distance from the city center. The terminal is at Port Vell in Barcelona which is at the Southern most end of the famous Ramblas. The seaport terminal is only 10 min's walk from the Ramblas. However, since there are several cruise terminals at the port and if you are in one of the terminals which are further away from the Ramblas you may catch a taxi or the shuttle bus, which will take you to Monument Christopher Columbus which is at the Southern most end of the Ramblas. The shuttle bus service runs from all port terminals down to the monument. There is a port shuttle bus that goes from the cruise terminals to the Columbus Monument at the bottom of Las Ramblas. The bus is called Cruiser T3 but is often referred to as the 'Blue Port Bus'. The fare is €2 per person. You cannot use a T10 ticket on this bus. The nearest metro station is Drassanes which is on line L3. It is about 2-3 minutes walk from the Columbus Monument, where the shuttle bus stops. The bus is wheelchair friendly. If your ship will be moored at Moll Barcelona (the Barcelona Pier with the North and South Terminals) you can walk in 5 minutes to the monument. On this pier is also the World Trade Center with car park. Most likely you will be docked (larger ships) at terminal A, B, C or D.
A taxi is a good bet (around 15 Euro) if you want to go to Placa de Catalunya with its famous stores and stroll back, slightly downhill, over the Ramblas towards the harbor. Taxi back will be 2.10 euro more, due to port charges. Do not pay more than that as cabbies make you believe. As your hand luggage is checked by the port authorities itself before entering the modern terminal, there is ample of opportunity to stock up on your favorite alcoholic beverage in the competitive priced tax-free shops before boarding. No carry-on bags will be checked when boarding the ship. In spring 2018, Carnival Corporation opened a new terminal, which is designed to accommodate Carnival's next-generation ships, powered by eco-friendly Liquefied Natural Gas (LNG). Ships from eight Carnival brands -- AIDA Cruises, Carnival Cruise Line, Costa Cruises, Cunard, Holland America Line, P&O Cruises (U.K.), Princess Cruises and Seabourn -- visit Barcelona throughout the year. Check here for festivals and events in Barcelona when you are in port. Barcelona balances itself on the cutting edge of architecture, intellectual life, and style. Among the city's unique delights is its Picasso Museum, palm-lined avenues, striking Gaudi architecture, revamped beachfront, and late-night club scene. The capital of Spain's Catalonia region is one of the country's -- maybe even Europe's -- most beautiful and vibrant places. A city of contrasts, it is like no other in Spain; this is most evident in its architecture, a marriage of Gothic spikes and modern curves. Barcelona is also a city of neighborhoods, all distinct, which are surprisingly walkable and easily accessible by bus, metro or even on foot (in comfortable shoes). Don't miss a stroll along Las Ramblas, replete with produce and flower stands, a historic opera house and a thoroughly intriguing open pet market. Maybe you will be there when they are celebrating one of the many fiestas: whether they are celebrating a saint's day or the changing of the seasons, the people of Barcelona fill the streets with color, music, and excitement for young and old. Experiencing the traditions ranging from Spanish to Catalan or even unique to the city of Barcelona, adds to a visitor's enjoyment like nothing else can. The largest fiestas in Barcelona are Sant Joan (Saint John) on June 23rd ringing in the summer, and La Mercè for the Patron Saint, September 24th. The most beautiful holiday is undoubtedly Sant Jordi (Saint George) – the day of the book and the day of the rose April 23rd. The Picasso Museum in Barcelona is indispensable for understanding the formative years of Pablo Ruiz Picasso. The genius of the young artist is revealed through the more than 3,500 works that make up the permanent collection. However, the Picasso Museum also reveals his relationship with Barcelona: an intimate, solid relationship that was shaped in his adolescence and youth, and continued until his death. Thanks to the wishes of Picasso and his friend Jaume Sabartés, Barcelona now has the youthful work of one of the twentieth century's most significant artists. Miró's works are to be found today in the world's principal museums and cultural institutions. Many, however, have remained in Catalonia, mostly in the Joan Miró Foundation in Barcelona. Throughout his life, Joan Miró took a particular interest in the diversity of materials, forms and colors. It led him to explore and experiment with different art forms such as painting, sculpture, printing techniques, ceramics, the theater, and tapestry. One result of this was a collaboration with Josep Royo, an innovative craftsman, who during the seventies aroused Miró's interest in tapestry and textiles. Rent a bike or take an excursion by bike with an English speaking guide showing the most important sights of Barcelona: the Gothic Quarter with the cathedral, the Old harbor with the statue of Columbus, the Ciutadella Park, the Sagrada Familia, the Olympic Port and Gaudi´s fabulous monuments with Fat Tire Bike Tours Barcelona. The best place for a ride is along the well-marked bike lanes by the sea, which lead to the medieval streets of the old city, past busy ports and down to beaches. If you're willing to brave traffic and tackle a few hills, you can crisscross the city and there are many more bike lanes in the planning. A guide and a map can be purchased at the Tourist Offices. 3 routes with 44 stops are available with the ‘Hop on hop off' Barcelona Bus Turistic. If you are coming to Barcelona for the first time, or if you are planning to stay in the city for a short time, this is one way of getting to quickly see the city's monuments and most important tourist sights of interest. 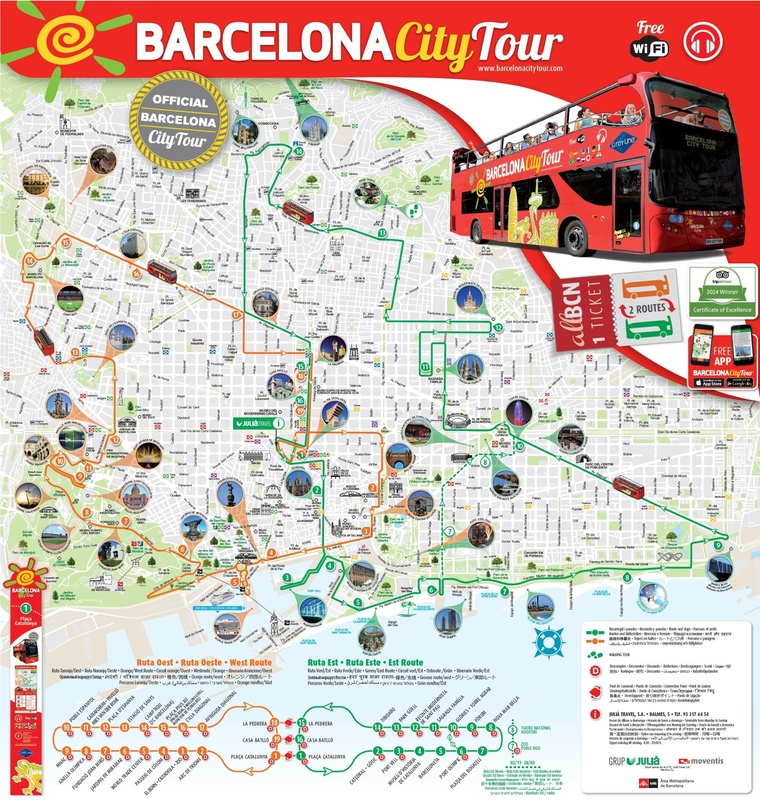 The two-hour blue route covers north Barcelona (most Gaudí sights); the two-hour red route covers south Barcelona (Barri Gótic, Montjuïc); and the shorter, 40-minute green route covers the beaches and Fórum. The Barcelona Tourist Office offers, among other interesting tours, 4 different, english speaking, guided walking tours, including a Gourmet walk in which you will find out about the history of Barcelona's cuisine as well as some of its flagship restaurants and food outlets, and sample some of their products. If you want to see Barcelona from a birds eye point of view, ride the Montjuic cable car. You can buy tickets on board. The entrance is not to far from the harbor, just follow the cables to the entrance. If it is too windy, the cable cars won't run. So simply look to the sky to see whether they are running or not. Nova Icaria, Bogatell, Mar Bella and Barceloneta are all beaches in Barcelona which has restaurant and café lined promenades. For many visitors a trip to Montserrat is the highlight of their visit. Montserrat is a spectacularly beautiful Benedictine monk mountain retreat about one hour North West from Barcelona by train. Not only is Montserrat Monastery of significant religious importance but the natural beauty surrounding the monastery is simply breathtaking. The cable car ride up the mountain is simply spectacular. If you love to shop then you're going to love Barcelona! Barcelona Spain shopping offers around 35,000 shops. The city is also home to the famous 5 KM shopping line. The shopping line stretches from the top of the Ramblas, through Placa de Catalunya along Passeig de Gràcia and up Avenue Diagonal. Much of the shopping line is pedestrianized making it a pleasant experience to wander from shop to shop without worrying about traffic. Along the Ramblas you will find La Boqueria A very colorful food market which also sells other goods and souvenirs. Also along the Ramblas you also will find the Gothic Quarter, the medieval part of Barcelona. Here you will find many fine restaurants and outdoor cafe's as well as great stores who specialize in colorful ceramic goods of top quality. The Ramblas is also the world's most pick-pocketed area! Barcelona has free Wi-Fi in the city - they are currently working on completely covering the city, but it's not there yet. Around the Ramblas, the reception is generally good. The most common business for shops and businesses hours are Monday through Saturday, from 9.30 oh to 13.30 oh, and from 16.30 to 20.00 h.
Big shopping centers and department stores open from 10.00 h to 21.00 or 22.00 h uninterruptedly. These big stores open in December sometimes on Sunday.